Though the AP headlined its story, “U.S. poverty rate declines significantly,” NBC anchor Brian Williams reported it dropped “a bit” and CBS anchor Katie Couric relayed how “the poverty rate is down slightly.” And while most of those in poverty manage to have many comforts of life, from good-sized homes to cars, Couric insisted poverty level income is “hardly enough for food and housing, much less other items like health insurance.” Wyatt Andrews devoted a full story to “the highest number of uninsured Americans in 20 years: 47 million without health insurance.” Andrews failed to note that 16 million of the uninsured are illegals or on Medicaid while most people are uninsured for only short periods. There's news on the economy tonight. The percentage of Americans living in poverty dropped a bit last year to 12.3 percent from 12.6 percent of the population the year before. But there was bad news on this front as well. The number of Americans without health insurance has gone up from nearly 45 million in 2005 to 47 million Americans last year. Most of America's "poor" live in material conditions that would be judged as comfortable or well-off just a few generations ago. Today, the expenditures per person of the lowest-income one-fifth (or quintile) of house-holds equal those of the median American household in the early 1970s, after adjusting for inflation. - Forty-three percent of all poor households actually own their own homes. The average home owned by persons classified as poor by the Census Bureau is a three-bedroom house with one-and-a-half baths, a garage, and a porch or patio. - Eighty percent of poor households have air conditioning. By contrast, in 1970, only 36 percent of the entire U.S. population enjoyed air conditioning. - Only 6 percent of poor households are over-crowded. More than two-thirds have more than two rooms per person. - Nearly three-quarters of poor households own a car; 31 percent own two or more cars. - Ninety-seven percent of poor households have a color television; over half own two or more color televisions. - Seventy-eight percent have a VCR or DVD player; 62 percent have cable or satellite TV reception. - Eighty-nine percent own microwave ovens, more than half have a stereo, and more than a third have an automatic dishwasher. - Analysis of data from earlier Census Bureau and other government reports shows that roughly 7 million are illegal immigrants; roughly 9 million are persons on Medicaid; 3.5 million are persons already eligible for government health programs; and approximately 20 million have, or live, in families with incomes greater than twice the federal poverty level, or $41,300 for a family of four. - Most of the uninsured are in and out of health coverage. The professional literature also shows that, overwhelmingly, the vast majority of the uninsured are persons who are in and out of coverage, largely as a result of job changes. Only a small number of the uninsured are chronically uninsured. For most of the uninsured, the problem is fixable if policymakers simply take steps to make health insurance portable, so the insurance policy sticks to the person, not the job. - Current Federal Tax Policy Fuels Uninsurance. A substantial portion of uninsured Americans are not poor but rather middle-class working Americans who are forced to face a major tax penalty, resulting in premium increases of 40 to 50 percent, if they do not obtain health insurance through the place of work. For millions of Americans without job based health insurance, both the tax policy, and the excessive regulatory burden on health insurance in the states, prices families out of coverage. Current federal tax policy then unnecessarily drives millions into the ranks of the uninsured. KATIE COURIC: Here at home, mixed economic news tonight. For the first time in six years, the poverty rate is down slightly. In 2006, 12.3 percent of Americans lived in poverty, down from 12.6 percent in 2005. Poverty level income for a family of four is $20,400 a year, hardly enough for food and housing, much less other items like health insurance. And as Wyatt Andrews reports, more people are going without. WYATT ANDREWS: It's the highest number of uninsured Americans in 20 years: 47 million without health insurance and dozens of them come in every day to the free clinic in Arlington, Virginia. For house cleaner Mariah Carvealio, who makes $8,000 a year, the clinic is her only option. What if this clinic did not exist? CARVEALIO: Yes, because I was so sick. 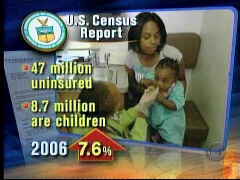 ANDREWS: Of the 47 million uninsured, 8.7 million are children, a jump of more than 7 percent in one year. The numbers are rising mostly because employers are dialing back. In 2000, more than 64 percent of Americans got insurance through their employer. Last year, that percentage fell below 60. This decline in employer-based coverage is happening because of costs. More and more employers these days struggling to stay afloat or profitable cannot afford the rising expense of health insurance. At the clinic, director Nancy Palleson says most of the uninsured and most people in poverty are working. NANCY PALLESON, ARLINGTON FREE CLINIC: Maybe both parents are working, two or three kids, and they can't -- they can't get health insurance. They can't -- even if it's offered, they couldn't possibly afford it. ANDREWS: The census brought mixed reviews on poverty itself. While the percentage of Americans in poverty fell, the number of people held steady at 36.5 million. This free clinic is a snapshot of the income gap in America. Everyone here is a resident of Arlington, which is listed in the census report as one of the richest counties in the country. Wyatt Andrews, CBS News, Arlington, Virginia. 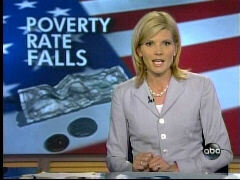 ANCHOR KATE SNOW: A bright spot of economic news today that's been years in the making. The percentage of Americans living in poverty, dropped last year of 12.3 percent, a drop of three-tenths of a percent from the year before. A total of 36.5 million Americans were living below the poverty line in 2006. It's the first significant decline this decade. 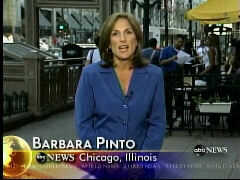 Here's ABC's Barbara Pinto. BARBARA PINTO: The reason for today's good news is, in a word, jobs. DOUGLAS BESHAROV, AMERICAN ENTERPRISE INSTITUTE: It's true that a strong economy is the best anti-poverty program that exists. PINTO: Unemployment is falling. In the past four years, the country has added nearly 7 million jobs. 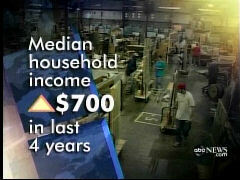 And in those four years, the average household income has risen about $700. Another bright spot? More single mothers, once the bulk of the nation's poor, are finding workm largely due to welfare reform. East coast states, such as Maryland, New Hampshire and Connecticut, have the lowest poverty rates and are making strides. Among the highest in the nation, Mississippi, New Mexico and the District of Columbia. At the Chicago community assistance program, Sheryl Holman is on the front lines. She says even families who have pulled themselves out of poverty, are still struggling. SHERYL HOLMAN, CHICAGO COMMUNITY ASSISTANCE PROGRAM: I'm afraid that they're saying that the working poor is not poor, when they are poor. PINTO: The government defines poverty as a family of four making about $20,000 a year. HOLMAN: $20,000 a year is about $10 an hour or more, a little more between $10 and $11. If you measure that, who is living off of $10 an hour. PINTO: Analysts also say the dip in the poverty rate pales in comparison to the booming economic growth this country has enjoyed for years. SHELDON DANZIGER, NATIONAL POVERTY CENTER: Now, we have an economy, where most of the economic growth is concentrated among people who have high incomes. And there's very little that trickles down to those at the bottom. PINTO: Obviously, some of that growth is trickling down. In addition, the recent hike in the minimum wage, was not factored in the numbers that were released today and economists say that could make those poverty numbers look even better in the future.